Last Friday at the end of a long and distressing week, Civil Rights Project Director Mary Bonauto had a message for GLAD staff and supporters: welcome to the resistance. Our community has faced challenging times before. But we know how to fight. We’ve heard from many of you over the last week who are understandably feeling shock, grief, and uncertainty – I’m feeling it too. But we’re also hearing incredible statements of resilience and resolve. I want you to know that GLAD is here for you. We’re committed to protecting the civil rights that our constitution promises all of us. We have experience and resources to share and we will do everything we can to prevent a new administration from reversing hard-won gains. Even though we are in a very different political world, and there will be challenges ahead, bedrock nondiscrimination laws remain and the federal and state courts are open to all of us. GLAD will ensure the robust enforcement of those laws and will fight to protect the community when those laws are broken. And I know you’re with us in the fight. 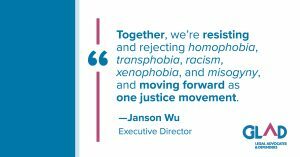 Together, we’re resisting and rejecting homophobia, transphobia, racism, xenophobia, and misogyny, and we’re ready to move forward as one justice movement. Know your rights. Check out GLAD’s information, including our FAQ on the possible impact of the next administration, and share it with your community. Spread the word about our legal rights resource line, GLAD Answers – and contact us if you have a specific question or concern. Help us build GLAD’s legal network [new link? ]– especially in rural or underserved areas. If you are an attorney willing to provide pro bono services or you know attorneys, spread the word! Support the organizations that are protecting Muslim Americans, women, Black and brown Americans, immigrants, and youth. Huffington Post has compiled a great list, to start with. Our community knows how to fight, and how to take care of one another. We will rely on that resilience and resistance, on all fronts, for the next four years and beyond. Please continue to keep in touch. We couldn’t be prouder to stand shoulder to shoulder with you.